I try to be measured in my praise for spacecraft images. Not every photo can be the greatest space image ever. But this enormous mosaic showing the flattened globe of Saturn floating amongst the complete disk of its rings must surely be counted among the great images of the Cassini mission. From Earth, we never see Saturn separate from its rings. Here, we can see the whole thing, a gas giant like Jupiter, separated at last from the rings that encircle it. Even the ring shadows only barely show up on the globe, since they're cast on the southern hemisphere, mostly hidden from view. 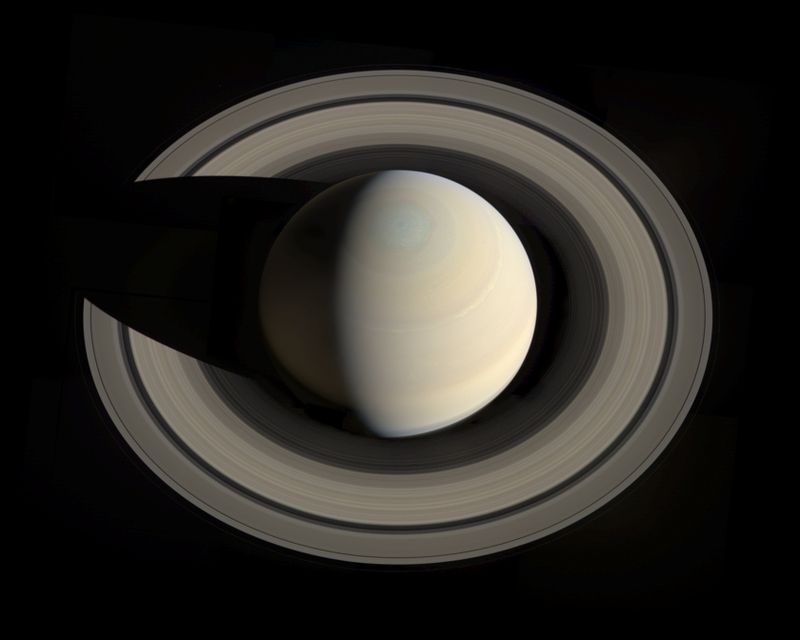 The one effect of the rings that can't be removed from the globe is the bright ringlight that's cast on the night side of Saturn. Seen from high above the equatorial plane, the globe of Saturn sits clearly separate from the disk of the rings. Cassini captured a three-by-four mosaic of red, green, and blue-filter images on October 10, 2013 to produce this stunning photo of Saturn, a view never possible from Earth. Awesome. And massive kudos to Gordan Ugarkovic for producing such a stunning image product from the raw jpeg images at the Cassini website. Amazing what NASA can accomplish while our ruling government is nonfunctional. Just imagine what it could do with a functioning one? Yes, this deserves the praise. This is worthy of the word "awesome". "Amazing what NASA can accomplish while our ruling government is nonfunctional. Just imagine what it could do with a functioning one?" Exactly right Emily! The chronic neglect of the US government for NASA, is trully an outrage and a travesty! The real thing beats any CG creation any day! Definitely one of the best outstanding shots in a long long time! Saturn as a prop for political babbling. Kewl.